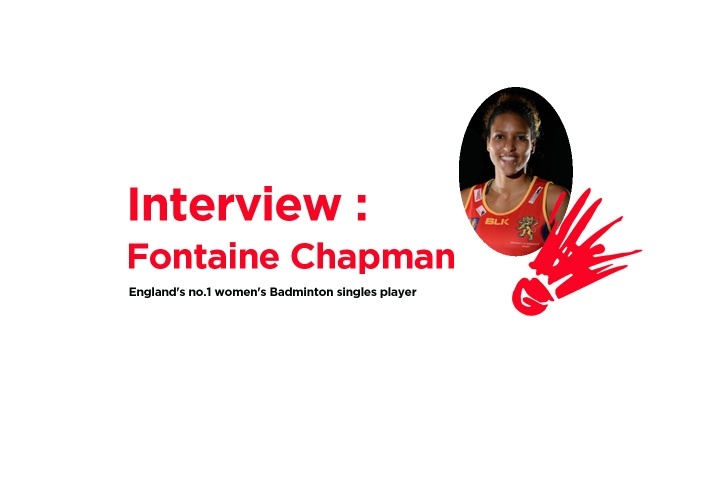 We spoke to England Badminton's highest ranked player, Fontaine Chapman on what 2015 has to offer her career both on and off the court. Whilst juggling an intensive training regime and part time MSc in Journalism, we asked the Coventry-born athlete her thoughts on the importance of live televised coverage and what the future holds for Badminton. Harrod: The new National Badminton League is being televised live on Sky Sports – how important is coverage such as this for the sport? Fontaine: I think coverage like this for badminton is so important. The fact that our sport doesn't get much media coverage at all is such a shame because everyone I speak to always says how much he or she loved playing it at school or found it great to watch when it has been on tv. I think this new coverage on Sky Sports can do great things for badminton and hopefully the ratings will keep on increasing as the NBL grows! Harrod: As a journalism student, what are your thoughts on the coverage of badminton across the media? Fontaine: I don't think badminton gets the coverage it deserves in the media. We have some amazing athletes that are incredibly talented in the England and GB team at Milton Keynes and I think it's a shame that people aren't aware of this. The game itself has evolved so much over recent years and it's not the same long drawn out game people used to think it was. Its now exciting & fast paced, the world's best players aren't only skilful but they are physically some of the best athletes you could watch compete. I hope that one-day badminton will receive much more coverage and people will talk as passionately about it watching it as they do for tennis. Harrod: You tweeted about loving playing in the Badminton England under-17 ICT – what memories do you have of the tournament and how important is it for the sport's future? Fontaine: I don't think you could get a better tournament as a junior badminton player than ICT. I had a sister 3 years older and a cousin 2 years older than myself that also played in it so when I was 12/13 years old I would go and watch them play. I remember making it a goal of mine to get into the Warwickshire team as soon as possible... I made it in when I was 15! I remember watching my sister play, shouting as loud as possible and not even being able to hear myself because everyone else was doing exactly the same as me. Badminton is a very individual sport, especially for us singles players, so its an incredible feeling to go onto court as part of a team and have their support carry you through a whole match. I never forget misbehaving at home and my mum saying if I didn't behave myself I wouldn't be allowed to go ICT, I think I did all my homework and chores everyday without fail after that! ICT has given me so many memories and I was lucky enough to play in it for a number of years with players from all over the country that have become some of my closest friends. I don't think I've ever heard a single player complain about ICT or say they didn't enjoy it. Everyone loves staying over and being on the campus together, although I'm sure some counties would disagree with me, as Warwickshire would always get woken up by our team manager (my granddad) playing the trumpet (and badly at that) or singing!! I really enjoyed going to watch this year and hand out the medals to some very talented players. Harrod: Do you feel that enough young sports fans are encouraged to play badminton? Fontaine: I always think more could be done to encourage young people to play badminton. I think it's a lot easier to encourage young sports fans and active children as they are already out there trying new things but I believe its harder to get children involved who may not enjoy PE at school or who don't have much confidence in themselves. I think it is just as, if not more, important to encourage them. Badminton England started a new school campaign for badminton called Smash Up! Which I was involved in and spent 8 weeks working with a school in Leeds as a Smash Up! Activator and the kids loved it. Each week we had around 15-20 pupils turn up after school to play with their friends which I thought was great and I hope more of that will continue to happen across the country and in the future. Harrod: You are now ranked as the number one women's player in England. Does this bring any added pressure? Fontaine: I think the only unwanted pressure it brings is what I put on myself. I know from experience that everyone wants to have a go at taking on the best and seeing if you can beat them, so of course there is always pressure when your expected to win, but you have to expect that when you are number one. For myself it acts as a real motivation though to stay on top of my game and make sure that I keep my number one spot! Harrod: We hear so often about how sports professionals need to be role models. Now that you are England's number one, is this something you are mindful of? Fontaine: I don't necessarily see myself as a role model because I'm just a badminton player trying to be the best I can be! However, I am aware of it, especially when I attend such events like ICT, and I would be truly honoured if I inspired or became a role model for anyone. I think it is vital for young people, especially girls, to have role models in sport. For boys there are so many footballers, athletes, tennis players and golfers in the media for them to look up to that young girls may not believe there are sports women out there who are just as good. Harrod: What words of advice would you have for young aspiring badminton players? Fontaine: For a young aspiring badminton player, I would say never give up! I know it sounds cliché but its true, if I had given up after having an ACL reconstruction in my right knee at 18 or prolapsing a disk in my back at 21 and losing my England funding, I wouldn't be where I am today. Those knock backs made me stronger and more determined than ever to achieve my dream and although it took a little longer than id hoped for and with a few bumps along the way, I finally got to represent England and achieve my first cap at a team championships and I am now apart of Team GB. Hard work and persistence is key but you also have to enjoy and love what your doing! Harrod: You must have a very busy schedule, competing in events, training for Team GB and England, and studying for a degree. How do you fit everything in!? Fontaine: That's a good question! Sometimes I'm not really sure how I do fit it all in! I have to be very organised and disciplined with my schedule at times otherwise I would just train, eat and sleep and never get any studying done! Every since I became a full time player, I have always had a busy week trying to fit all my training in alongside studying, working to earn some extra money and competing so I am used to all the craziness, but now I am a funded full time badminton player and I only study for my masters degree part time it has become a little easier. I do however like to procrastinate a lot by spending time with my family, especially my nephew who is almost a year old, shopping or watching films with my boyfriend! Harrod: If you had one wish that would come true, what would it be? Fontaine: If I had one wish for life in general, it would be to become successful enough that I could look after my mum and grandparents for the rest of their lives and none of us would have any financial worries. After all they have done for me, I would do anything to ensure they could live life without any stresses as they got older. For more information on how you to can get involved with Badminton, visit www.allenglandbadminton.com or check out our other Team Talk posts here.